Come with us to the Kerala backwaters to explore the simple village life in areas that are still not exposed to rush of tourism, where people are warm and nature is pristine. We embark on an adventure, exploring the village and visiting interesting places along the way, travelling on bicycles, canoe boat and foot. We want you to truly experience the magic of the Kerala Backwaters. Meet and interact with villagers, learn about their livelihoods. Visit local market, the village harbour, local small industries and various interesting places. Taste toddy, the freshly brewed local alcoholic beverage that is tapped from the coconut tree at a toddy shop. Lay back and enjoy a canoe boat ride as the sun is setting behind you. Have a sumptuous Kuttanadan dinner made from all locally sourced fresh ingredients. Become part of an endeavor that brings the benefits of tourism to a local community, while at the same time ensuring a low ecological footprint. Available daily. Pickup can be arranged from Kochi. For Pickup from Kumarkom or Alleppey please enquire with us. Bike rides through local markets and paddy fields, stopping at different places of interest! An hour long canoe ride through pristine backwaters with gorgeous views along the way. A stop at a local fishing harbor on the beach, where you can see the catch of the day being loaded onto trucks. Enjoy a delicious meal cooked from freshly available ingredients in a beautiful setting besides the backwaters. After being picked up from Kochi, you will be driven to a charming lodge by the backwaters. Here you will meet your guide, who will explain the activities for the day. The guide will also ask you about your food preferences. You will then get on your bike and enjoy a leisurely ride around the villages. Along the way we will stop at the coir mat making factory, prawn peeling and sorting factory, and other points of interest in the area. If you feel adventurous ask your guide to stop by a toddy shop for a drink – toddy is a local alcoholic beverage brewed from tapping the coconut trees. If at any point you want to stop riding your bike let your guide know and you can continue the journey in a car. 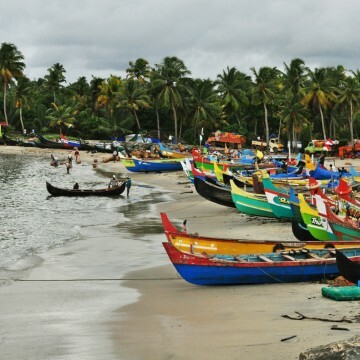 After about an hour of riding you will reach a local fishing harbor where you can witness fishermen load their catch onto trucks heading all over south India. From the beach, a short walk through the fishermen settlement will lead you to a canoe. As the sun is setting behind you, your canoe will navigate through backwater channels to reach the same lodge where you started. After a brief rest, you will be served a delicious meal with a variety of local dishes. Post dinner you will be driven back to Kochi and dropped off at your hotel. Transportation to and from the location, bicycles, boat rides and dinner are all covered by us as part of the experience. "After a week in Kerala, this Travspire experience was the perfect way to get off the tourist track and see something new. The biking was tons of fun, the boating beautiful, and the food delicious. All of our stops (including a local Toddy shop) were at places we would never otherwise have had access to, and it was great to experience authentic Kerala with our excellent Travspire guides."